I'm hardly a hair-band connoisseur -- I don't really know my Wingers from my Warrants -- but even I recognize '80s permy perfection: Europe. 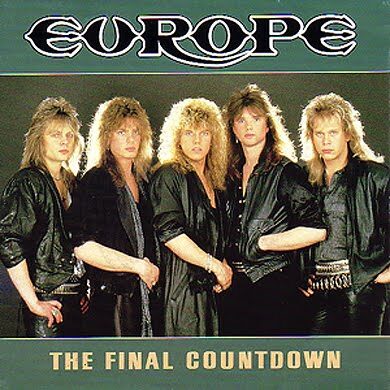 When the synth-tastic opening notes of the Swedish rockers' "The Final Countdown" first hit radio airwaves in 1986, who could have predicted that the tune would still be floating around in our much-less-hairless heads today? No, the lyrics haven't exactly aged as well as the melody: "We're heading for Venus, and still we stand tall." Um, what now? But still, pro sports teams, wrestlers and even magicians -- "Arrested Development's" GOB Bluth being the most perfect example -- have used the "doodle-DO-do, doodle-DO-DO-DO" anthem to rev up crowds over the past 25 years. How could we forget it? Thanks to this phenomenal list of the 10 worst "Final Countdown" renditions from UpVenue, we don't have to. The original hit #1 in 25 countries, but it doesn't hold a lit lighter to the "kazookeylele" version. Here's a taste -- you're welcome.